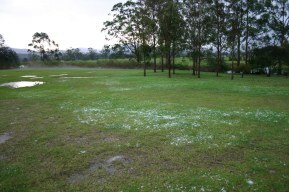 Remaining hail at Bulahdelah. This photo was taken more then 45 minutes after the storm first hit. Photo taken at 3:44pm EST on the 24/10. An outbreak of thunderstorms occurred over the weekend and this afternoon across a widespread area of the Hunter Region. The thunderstorms were multicellular and they produced brief heavy showers, squally winds and some hail. On Saturday, the thunderstorms developed mid to late morning with many sperate storms cells hitting Maitland, Cessnock and the Singleton area. A severe thunderstorm (hailstones greater then 2cm) occurred between Dungog and Gloucester on Saturday (22/10) between 4 to 5pm. Hailstones as large as 6cm were reported in this area. This afternoon, another severe thunderstorm travelled from the Dungog area to Stroud and Bulahdelah. Hailstones were reported as large as 5cm in Stroud and Bulahdelah. This thunderstorm developed over the Barrington Tops and hit Stroud and Bulahdelah from the northwest. Other severe storm cells were observed in the Gloucester district. Radar image taken at 2:20pm EST on the 24/10/05. 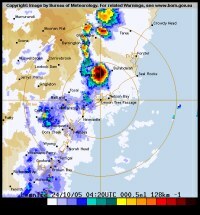 A 'black' rain intensity can be noticed approaching Bulahdelah. The black indicates possible large hail with heavy precipitation.